These Couplings are of all-steel construction, compact, and capable of transmitting relatively high torque, even with limited space constraints. Flexibility is obtained by lateral play in the fit of the chain over the sprocket teeth (zero cirumferential play). The simplicity of design allows easy installation and removal. The two sprockets are identical in dimensions and construction, and provide a balanced unit during operation, with vibration-damping characteristics. 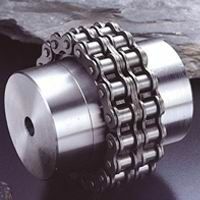 In addition the flexibility of the roller chain, and the clearance between the chain rollers and sprocket teeth, allow slight angular misalignment of upto 1o (maximum) and shaft-end float.